I was reading a little ditty about the Breeders’ Cup winner Hansen. It is a feel good story for horse owners. His owner is Dr. Kendall Hansen, and he has a big barn of two runners. His stark white colt by Tapit is eye-catching. 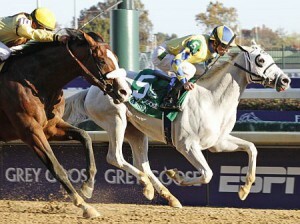 When he won by a scary 1/2 length at Churchill Downs in the Breeders’ Cup Juvenile, it was a huge day for the outfit. Well, the colt wanted to run in the Gotham at Aqueduct. Or, I should say the owners wanted to point the speedy fella that way. But, they had a little request. They wanted to dye the mane and tail blue, and have some fun promoting racing. They are from Kentucky, and if you have any sporting blood you will know there is plenty of blue in Kentucky. Bluegrass music, the rich limestone bluegrass, and of course the number one NCAA basketball team in the nation. Now, I don’t know for sure as I have heard many conflicting reports about the color blue, but the request was denied by the stewards in New York. Now, I know they have a job to do, but the color blue is not visible by runners. Not being a vet, I couldn’t tell you if they can distinguish the color blue from orange, pink, or mauve… But, they still denied the request with a professional letter. I was thinking about this the other day, and an idea hit me. Hansen ruled at Turfway Park winning two races by a country mile in both efforts. How about this? Dr. Hansen could ask the commision if he could dye the mane and tail pink. There could be a donation from the owner’s share of the purse dedicated to the breast cancer foundation, and it would stand out like a pink flash dashing around the poly oval. The Vinery Spiral Stakes would fit his wheelhouse as he loves the poly, and the feel-good idea would take the racing world for a fun ride. First, recognition on the national stage about the breast cancer awareness from a reputable doctor, and it would be fun seeing this beautiful animal run a hole in the wind. Now, it could be about silk colors, or something sentimental. Dr. Hansen has been good for the game and great for Kentucky racing. He already has enough graded earnings for the Derby, and his horse would be running in his backyard. He would be surrounded by throngs of cheering friends, and the colt would be 90 miles away from the Derby starting gate for trainer Mike Maker. They wanted to run in New York, but in a colorful fashion. I think he would fit the speed favoring track at the “Big A,” but this could be a great plan “B.” The race has a $500,000 purse, and the good doctor could possibly get a sendoff fit for a king. Either way, this weekend will unveil some runners that may be in the starting gate as well. But, Hansen loves Turfway Park. After BLAZING the clock in the Holy Bull, he gave us a little sample of possible things to come. Just one fan who loves the idea of getting an up-close glimpse of the speedy colt, Dr. Hansen has a blog dedicated to keeping the fans up to speed, and Jennie Rees from the Courier – Journal has done some great work. It could be fun, and maybe we would see a great performance. Kentucky racing could use some good news after an expanded gambling effort was defeated. If there is ever a time when the game in Kentucky could use a boost, it is now. If not, it was an interesting thought. Any place he decides to run, we can rest assured there will be a fast pace and a blazing white colt doing what he does best. Best of luck, and we’ll be watching wherever you run.